The adopted son of Julius Caesar, Augustus turned what was not long before him the Roman Republic into a powerful global empire. Bronzen statue of Gaius Julius Caesar Octavianus​, better known as Imperator Caesar Augustus. Augustus was born as Gaius Julius Caesar Octavianus on September 23, 63 B.C. in Rome, to Atia (his mother) and Octavius (his father). Atia was Julius Caesar's niece, making Octavianus (thereafter Octavian) the heir of Julius Caesar, the imperator of Rome at that time. According to some sources, Julius Caesar named Octavian his son by way of adoption. Growing up, Octavian excelled in military practice and planning, and he was characterized by a combination of a natural conservatism and political ambition. This had much to do with his upbringing in a country town as opposed to the large city of Rome. Augustus, while destined for greatness in the military, only returned to proper politics when Julius Caesar, effectively his adoped father, was assassinated by Brutus and Cassius on the "ides of March" in 44 B.C. Upon Octavian's return, Mark Antony and Lepius, two of Caesar's subordinates, had seized control of power in Rome. Through a series of struggles by being elected a Roman Consul (one of the leaders of Rome), Octavian eventually joined them as one of the three co-rulers of Rome, deemed as the "first triumvirate," at the age of 19. Ultimately, the triumvirate crumbled when Octavian defeated Mark Antony in the Battle of Actium in 31 BC. Shortly thereafter, Octavian was effectively in control of the new Roman Empire, which had been a Republic for almost five Centuries prior. He decided to share power with the Senate and, in return, the Senate,declared his new title Augustus, the title by which we know him today. 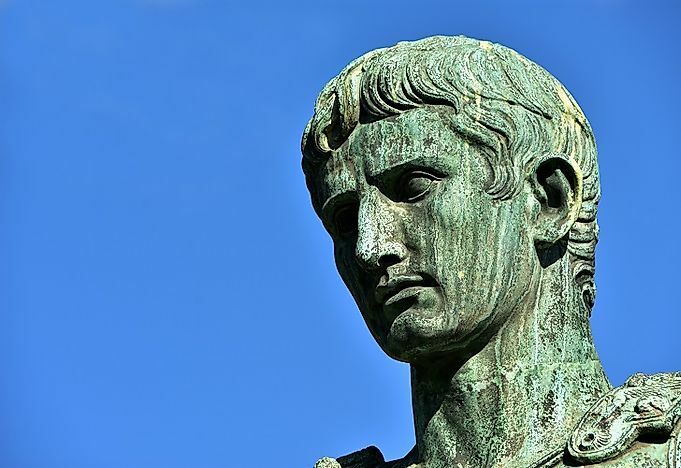 As the first official emperor of arguably the most powerful Western empire in history, Augustus contributed much to the history of the Roman Empire and the world at large. First, he consolidated the boundaries and stretched the extent of the empire by strengthening its army and sending large amounts of military personnel abroad. This act set a precedent, to some degree, for the practice of what we know as 'imperialism' today. He remodeled Roman civil services and rebuilt much of Rome as part of public projects, even appointing a fire-fighting service consisting of 3,500 men. Poetry and architecture also flourished under Augustus. The most crucial challenges Augustus faced were during his rise to power, when he was challenged by Mark Antony and Lepidus for rule of the empire, and then viewed as a potential tyrant by the people and the senate. He overcame the first challenge through military prowess and the second challenge through political ingenuity, crafting public works such as the temple containing the famous Res Gestae of Augustus. He was also, despite his hearty constitution, set back by illness in 23 B.C., but this ultimately helped his rule rather than hurt it as it allowed other leaders in Rome to gain prestige and honor while leaving Augustus's power largely intact. Augustus died in Nola, Campania, at age 76. This left Rome with problems of succession, ultimately nominating Tiberius. Augustus was declared to a God in 14 AD. He is largely credited with founding the Roman Empire, even if his adoptive father was the first leader to be officially called Emperor, because he consolidated the boundaries and was honored not as a dictator but as a rightful leader of the Empire. He founded the empire that would rule for 1400 years. The month of August is named after Augustus, and many buildings -- including his own tomb -- are now seen as prime examples of the beauty of Roman architecture.